There is an increasing number of uses for bags or pouches capable of entirely blocking radio frequency, including protecting the user against EMF radiation, as well protecting the privacy and security of items like passports and key fobs. These “Faraday Bags” or “RF Blocking Pourches” as they are often called completely block cell signals in or out. 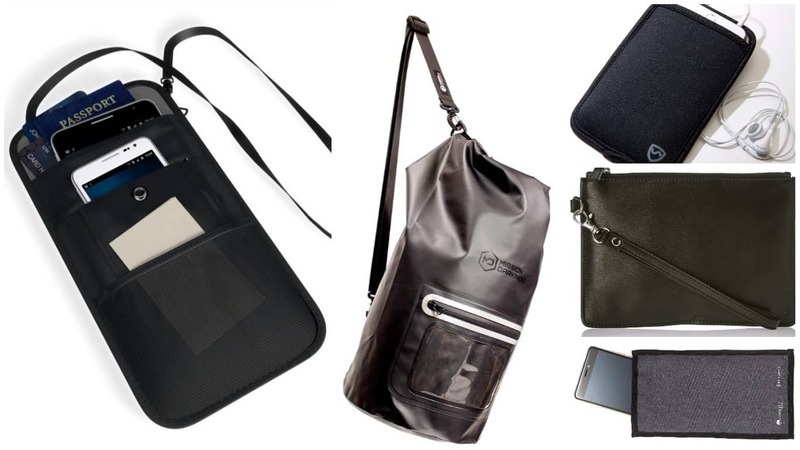 In this article I want to outline what the absolute best RF blocking bags and pouches are, as well as talk about all the amazing uses these Faraday Bags have. Let’s start by jumping right into the best gear on the market. These are certainly not all of the factors I took into consideration when trying to find the absolute best Faraday pouch or bag, they are some of the primary factors I looked at. Many of these bags are difficult to compare because they are quite different. However, my goal by trying out these products and comparing them was to help you understand all of the things these incredible bags can do, and understand which one might be best for you. Alright, enough chit-chat, let’s get to the best RF blocking pouches, and faraday bags currently on the market. The ConcealShield pouch from DefenderShield is (as much as a small faraday bag like this can be) completely fantastic. First of all, there are pouches and pockets all over it as you can see, all of which have a specific purpose. It utilizes military-grade EMF shielding that can completely block incoming, and outgoing signals from things like RFID, NFC, GPS, Mobile, WiFi, Bluetooth and more. 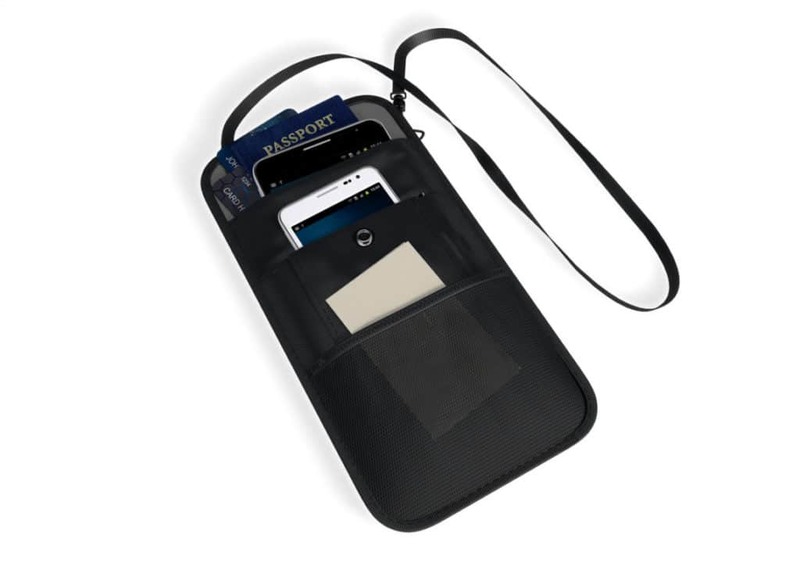 You can just take your cell phone, your passport, drivers license, credit cards, or anything else, and stick it inside the innermost pocket of the ConcealShield and it will become completely undetectable or trackable. 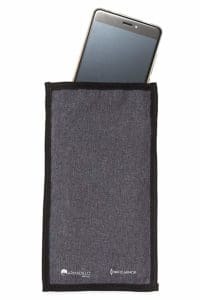 I tested this myself by putting my cell phone inside the primary pouch, called it, and it went straight to voicemail. My phone was instantly completely off the grid. I shared my cell phone location with my wife (allowing her phone to track mine) and then walked down the street and it did not move a blip. There are also many other pockets for various uses on the ConcealShield. On the outside is a pocket intended for your cell phone. This will block any EMF radiation from reaching your body, while still allowing your phone to send and receive signal. 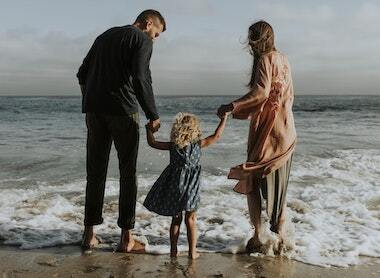 This allows you to protect yourself or a loved one, without losing connection. Here is a quick video from DefenderShield about their RF blocking pouch. The ConcealShield is also completely perfect for travel. You can put your cell phone, credit cards, passport, IDs, or any other trackable or hackable items inside and know that they are safe and secure. It’s also a convenient size with a nice strap that makes it fantastic to carry. Or pretty much anyone else. I’ve had my own ConcelShield for quite a while and absolutely love it. If you’re interested in purchasing one, you can get it directly from DefenderShield. 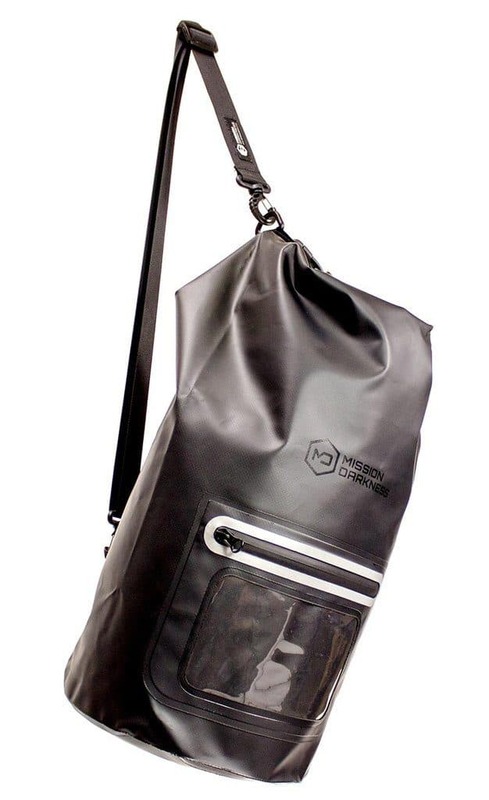 If you’re looking for a bit larger RF blocking or Faraday bag, don’t look any farther than this tote from Mission Darkness. Mission Darkness is a line or products from a company called MOS Equipment (Mountains, Ocean, Sky). They have an entire line of Mission Darkness products you can check out, from very small bags just for your key fob, to very large tactical duffle bags. However, I found that the 15L tote was the perfect marriage between quality, price, and features. The Mission Darkness Dry Shield Faraday Tote is a large completely waterproof bag, that you can use to shield all sorts of electronics. You simply open up the tote, place whatever you’d like to inside, roll it down and clip it shut. Not only will it completely protect whatever is inside, you’ll also be protected from the radiation emitted from those devices. The strap oh the bag is completely adjustable so it can easily be worn over the shoulder or however else you’d like to carry it. The exterior of the bag is made out of high-quality black tarpaulin for that attractive matte black look while also providing incredible durability. The interior of the bag is made out of two layers of high shielding fabric that will keep your devices completely offline, untrackable, unhackable, and stop all EMF radiation from getting out. Although the bag was originally designed for law enforcement and military, it is now used by civilians for all sorts of uses. With a very reasonable price, this bag can be used simply for travel, going to the beach, protecting your family from devices, or just about anything else. The 15L size allows you to fit multiple laptops, cell phones, tablets, accessories or anything else inside with ease. On the outside of the bag, you’ll notice a small clear plastic pocket. This pocket is not shielded, however, that is nice if you need to keep something readily available inside like an ID. Here is a quick video demonstrating the Mission Darkness 15L Faraday Tote so you can get an idea of how it works. Blocks Bluetooth, Cell Signals (including 4g LTE and more), GPS, RFID, Radio Signals, and WiFi. Overall I think Mission Darkness Faraday and RF blocking bags and totes are some of the absolute best on the market. Better yet, many of them double up as waterproof and weatherproof travel bags. If you’re interested in picking one up, you can shop the entire line on Amazon. If you’re looking for something small and inexpensive to put your phone, keys, ID’s etc. inside, then this is the pouch for you. It is a simple pouch, made of high-quality signal blocking faraday material. Think of it like a small black hole for your cellphones, IDs, key fobs, etc. Not only will it stop hackers from being able to access these things, it will also protect your body from the radiation being emitted. The Armadillo Pro-Tec RF blocking pouch is just a simple medium sized bag capable of holding several cell phones, IDs, key fobs, or anything else you might need to store. It closes with a convenient magnet, as well as single fold velcro for extra security. They claim that this is the only faraday bag on the market that will block 100% of RF signal and radiation simply by closing the magnet, even without rolling the velcro. According to the Amazon listing, the product also comes with a lifetime warranty. So if you’re just looking for a simple small bag to protect your devices or block radiation, the Armadillo Pro-Tec is probably a good option for you. SYB makes a bunch of EMF protection products that I really like, from baby blankets to laptop pads and even boxers. Their EMF protection pouch for cell phones is no exception to the quality I’ve come to expect from their products. I think it’s important to remember when looking at this product, that it’s primary intention is to protect the body from cell phone radiation. 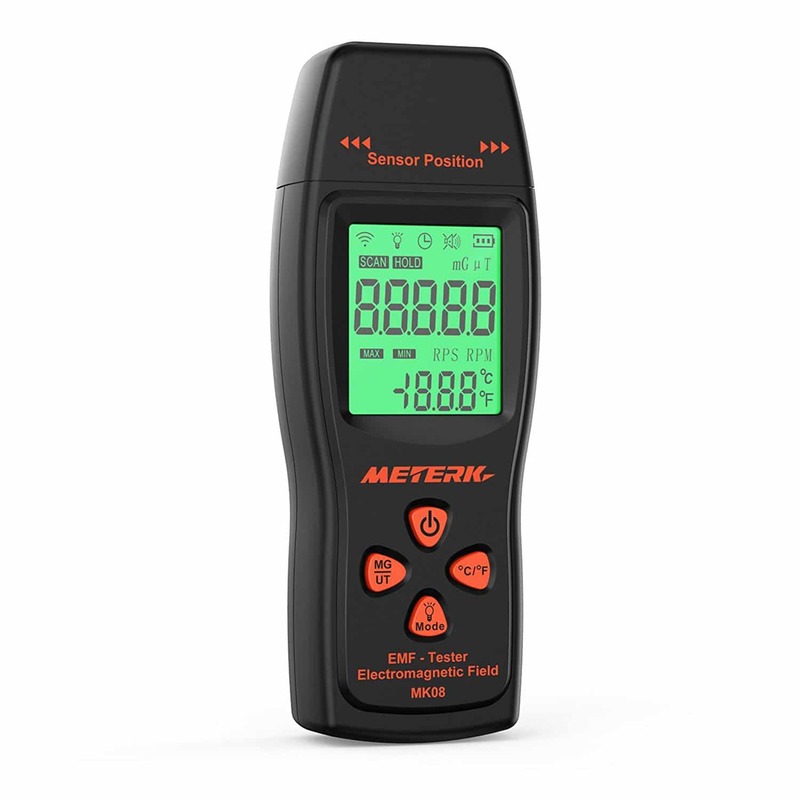 This makes it a fantastic fit for people who typically carry their cell phone in their pocket or on their person, as it will block up to 99% of EMF radiation. However, this also means that this pouch is NOT designed to completely block the signal from reaching your phone or to protect things like Keyfobs from hackers. Only one side of the pouch blocks radiation. It’s very reasonably priced and designed so that you can put it right on your belt. The pouch is designed to fit phones up to 3.25″ wide, and literally, all you have to do is place your phone inside the pouch, and it will block up to 99% of RF radiation, Microwave Radiation, etc. 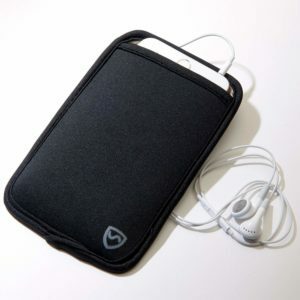 Again, this pouch will block radiation from reaching the body, but since only one side of the pouch has a shielding material, it will not cause your phone to work harder to maintain a signal. The side closes to the body is lined with a polyester-based fabric that has been woven with gossamer-thin metallic thread, composed of a nickel, copper, and cobalt alloy that forms a complete shield blocking EMF radiation. The pouch is extremely light and has been tested up to 99% effectiveness by the American Society for Testing and Materials (ASTM). This bag is pretty unique compared to the other ones on this list, but I think it can make a fantastic option for many people. Essentially it is a medium sized bag with a removable strap that blocks cell signal, Bluetooth, RFID, NFC, WiFI, GPS, and EMF Radiation. One unique feature of this bag that I really like is that the primary pouch blocks everything I mentioned above, while there is another pouch that only blocks RFID and NFC. This is extremely unique to this bag. I think that this Faraday Pouch from Silent Pocket is ideal for travelers. You can store your passport, tickets, ID, cell phone, money, etc in this bag and know that it is safe and secure. 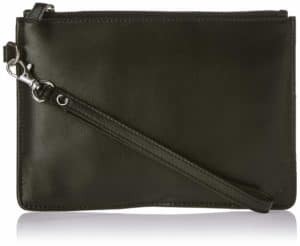 The outside of the bag is also made from a high-quality leather that looks and feels extremely nice. The inside layers of the bag are made out of a high quality is woven metallic fabric that is capable of blocking all signals. Overall I think this is a very high-quality RF blocking pouch that could be a great option for many people. Ok, now that we’ve covered what the 5 best RF blocking bags and pouches are, let’s talk about who they are for, how they work, and how you can test them yourself. What Is A Faraday Bag or RF Blocking Pouch? Certain metals, commonly copper, silver, or gold, block radio signals and EMF radiation. When these metals are woven together in a weave whose holes are smaller than the shortest wavelength of the frequencies the material is trying to block. Faraday cages traditional are any enclosure that can block electromagnetic fields. They can either be constructed with a continuous covering of certain metals and materials or in the case of many faraday bags or pouches, by a mesh of similar materials. Faraday cages or shields are named after the English scientist who invented them in 1836, Michael Faraday. Who Might Use A Faraday Bag Or RF Blocking Pouch? You’re looking for something to protect yourself from the EMF Radiation emitted from your cell phone, tablet, and other devices. You’re someone who values privacy and security, and you’re looking to keep prying eyes, hackers, or anyone else from being able to detect or alter your devices, IDs, key fobs, and more. However, all of the following groups are likely to benefit heavily from having bags such as these around. There are a few ways you can test the effectiveness of your Faraday bag, but I want to talk about the absolute best one in my opinion. Mission Darkness, who makes one of the bags on the list, also developed a completely free App just for testing its products or any other products that block electromagnetic frequencies. The app tests WiFI, cell signal, and Bluetooth simultaneously allowing you to gain a complete understanding of how well the product is working. Not only that, but it will also show you just how well it is blocking it, including an actually dB attenuation rating. So instead of just having a pass-fail, it actually shows how effective the bag was. Next, make sure your cell phone or device is connected to cell service, WiFi, and that Bluetooth is turned on. Open up the mission darkness app on your phone, and click the Start Test button. Wait about 20 seconds for the app to obtain base signal levels, then place the device inside your faraday bag or enclosure and seal it up. Wait about 40 seconds with the device inside the bag, and then take it out. Wait about another 20 seconds for the app to reconnect to service, and then hit End Test. Voila, you’ll have accurate results of just how well your faraday bag or pouch blocked the signal! Faraday Bags and Pouches have an incredible amount of uses and can benefit just about anyone. It’s important to first think about why you’re getting the bag before you decide which one is right for you. Some bags are better for privacy and security, while others are better for EMF protection. I truly hope you enjoyed my article, if you did, please consider sharing!